The area beside the Psycho house (known as Psycho Flats) used to be the site of Falls Lake - a large water-tank and waterfall used in numerous productions. Falls Lake has now been moved, and the area is currently occupied by the huge outdoor airplane crash set built for War of the Worlds, directed by Steven Spielberg. Spielberg and crew were on the Universal backlot for three days (Jan 5 - 7 2005) shooting on the massive outdoor set. The only change made to the set following filming was to move the houses on the right of the tram off the road (so the tram can pass safely). Those houses were originally covering the asphalt road. Filming also took place on Stage 27 and at other outdoor locations around the lot. The original movie sets from Steven Spielberg's film, "War of the Worlds," are the latest new feature to be added to Universal Studios Hollywood behind-the-scenes Studio Tour, the theme park's signature attraction which immerses guests in the authentic Hollywood experience. 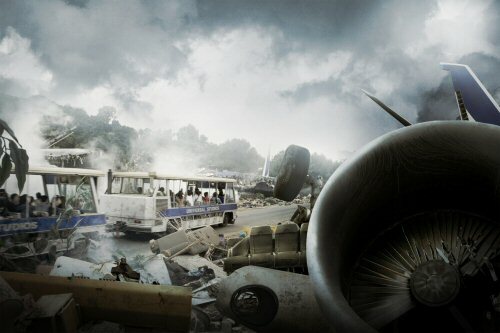 Guests aboard the popular Studio Tour tram ride will traverse a key scene from "War of the Worlds," depicting a small town devastated by an elaborately choreographed 747 jetliner crash. The town's facade is dramatically surrounded by wreckage and debris resulting from a Martian attack. In addition, Studio Tour guests will get up-close views of other movie sets located along the landscape that adjoins the "War of the Worlds" sets. 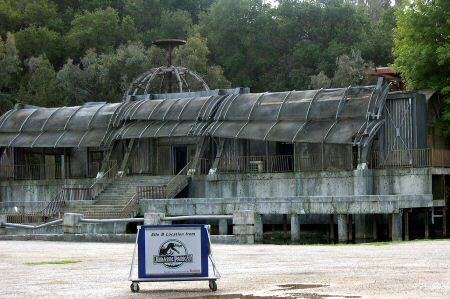 These include the dinosaur-destroyed research laboratory compound from "Jurassic Park: The Lost World," the snow-covered town of Whoville from "Dr. Seuss' The Grinch Who Stole Christmas" and the Psycho house and Bates motel from the classic thriller, "Psycho." The world-renowned Studio Tour takes guests on a 45-minute journey through Universal's 415-acres of movie making magic. Highlights include a vast array of sets, themed streets, soundstages and facades featured in thousands of motion and television productions as well as signature special effects attractions such as "Earthquake," King Kong," Flash Flood" and "Jaws." Steven Spielberg's "War of the Worlds" is a contemporary retelling of H.G. Wells' groundbreaking science fiction classic, which reveals the extraordinary battle for the future of humankind through the eyes of one American family fighting to survive. Before War of the Worlds, the large open area was used as Site B in Jurassic Park 3. The main set from that movie is still in place and can be glimpsed as the tram exits the War of the Worlds set. 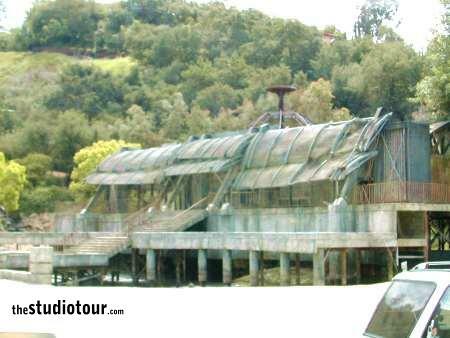 It's currently in a state of disrepair, and cannot be used for filming, despite the promised Jurassic Park 4.